Ridding your skin of unwanted oils, acne, blemishes and various other skin-related problems is often an exhausting and difficult process where all sorts of factors arise that ruin your desired perfect complexion. Fortunately, the Aztec Secret Indian Healing Clay exists, aiming to achieve the detoxification of all your skin-related issues. This product review should encourage you to make a decision on whether or not the Aztec Secret Indian Healing Clay is the right product for you, where we will thoroughly assess what features makes the Aztec Clay such a popular product and how effective it truly is. Whether it be the fact it's 100% Bentonite Clay or that it doesn't contain any additives, fragrances or animal products, we will therefore judge the product's effectiveness in eliminating skin-related complications. This review will be relatively detailed, so we recommend you bookmark this page if you currently don't have time to read this in its fullest, so in the meantime, feel free to click the button below to view the full product details and current pricing on Amazon. 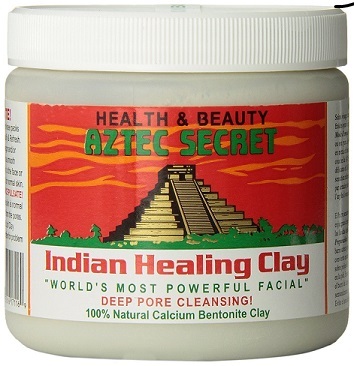 Are There Any Problems With The Aztec Secret Indian Healing Clay? Conclusion – Is It Worth Buying? Versatility- Can Be Used As An Oral Mask, Facial Mask, Hair Mask, For Skin Care And Even As A Dietary Supplement! Made from volcanic ash, this ingredient acts a traditional healing method and protects the body from disease. When combined with water, the clay binds bacteria and toxins that live on the skin's surface, extracting them from the pores. It helps to reduce blemishes, relieve redness and also fight allergic reactions caused by irritating lotions or face washes. It can also be used a soaking liquid to remove toxins on the skin. Bentonite clay not only contains calcium, but a range of other nutrients and vitamins but for the sake of this review, we will discuss just one nutritional benefit, calcium, where increased levels of calcium in the epidermis helps the body better regulate the generation of new skin cells to replace dead skin cells. The clay also has the ability to increase sebum production where calcium helps the skin retain moisture by stimulating stronger levels of the natural skin-coating substance sebum. 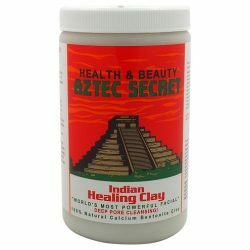 The Aztec Secret Indian Healing Clay is particularly ethical and beneficial because it only contains all natural ingredients and does not contain additives, fragrances, animal products, alcohol, ammonia, paraben (cosmetic product preservative), silicon and sulfate that could otherwise cause issues and problems to not only the skin's surface but body itself. It therefore contains minerals and other nutrients that aims to detoxify the skin and protect it from pimples, acne and other skin problems. This unique clay has gone through a long process of sun-drying, inhibiting the growth of bacteria, yeasts and mould through removing water, not necessarily a normal process for cosmetic products but ensures consumers are protected from harmful micro-organisms. The clay is specially sun-dried for up to six months in temperatures that reach up to a maximum of 134 degrees, in Death Valley, California, increasing the product's effectiveness. Basically, the sun-drying process of the Aztec Clay occurs with temperatures in California naturally higher than other states because it is an arid and mainly desert-based state. The inclusion of 100% Natural Bentonite Clay as well as many nutrients and vitamins such as sodium, iron, potassium, calcium and magnesium means you will receive the natural benefits in diminishing a variety of skin problems. Acne, blemishes, pimples and blackheads are just some of the issues the Aztec Secret Indian Healing Clay addresses, ensuring your skin will retain its moisture and be free of oily, unattractive and even painful skin complications. The true effectiveness of the Aztec Secret Indian Healing Clay stems from its versatility and complementary usage with other products, which are most of the time not even skin products themselves and are actually natural products. Users report using water, apple cider vinegar, Aloe Vera gel, rosewater and other clays as well. Although, it seems that apple cider vinegar is the most effective because its natural acidity compliments the relatively low levels of acidity within the Bentonite itself. The product is therefore special because many users praise the clay for its versatility and the fact that it works with many other skin-related natural products. The Aztec Secret Indian Healing Clay has an overwhelming amount of positive feedback and reviews across many websites, showcasing the effectiveness of the product with thousands of high-rated reviews. Amazon, generally where consumers purchased this product from had over 17,000 reviews, with an average score of 4.4/5 stars across 17,456 reviews. 72% rated 5/5, amounting to 12, 568 reviews and 14% rated 4/5, equating to 2,444 reviews. 6% voted 3 stars, 3% voted 2 stars and 5% rated one star. Other websites such as MakeUpAlley had average scores of 4.3/5 with 695 reviews and 86% of reviewers willing to purchase again (about 598 reviews), Vitacost was similar, with an average score of 4.8/5 across 250 reviews with 215 of those rating it an excellent 5/5 and Ebay, with 10 reviews but still with a total score of 4.6/5 and 9 of those reviewers rating the Aztec Clay 5/5. Therefore, it can be seen that the Aztec Secret Indian Healing Clay has quite a positive reputation among the cosmetic industry with its versatility, effectiveness and natural vitamins as its main positives. In terms of positive feedback, many users were satisfied and appreciated the overall effectiveness when used with apple cider vinegar, their healthy glow and appearance, the minimisation of pores and other skin-related problems, the removal of unwanted oils, its inexpensive price and easy access and usage. Many reviewers especially recommended that apple cider vinegar (ACV) to be used as its acidity compensated for the relative basic levels (on the pH scale) and greatly increased the Aztec Clay's effectiveness. Users also reported that multiple applications left them with general healthier glows, appearances and complexions, restoring ‘light' to their face, specifically the cheeks. It also performed its function, minimising pores and other skin-related issues where consumers reported reductions and removals in pimples, blackheads, whiteheads, blemishes and sometimes, even acne. With regard to negative feedback, there was a small percentage of reviewers whose skin just did not react well to the Aztec Clay, where some reviewers reported personal dissatisfying experiences where a few had allergic reactions to the contents of the Aztec Clay. The main issue was that the Clay actually worsened their pimples, lumps and white/blackheads. Users also reported having overly dry faces after applications, feeling ‘stripped' and ‘irritated'. Another recurring issue is that the product may not be suitable for specific skin types with reviews showcasing that the product is ‘not for sensitive, oily and acne-prone skin' as those that criticised the Aztec Clay had unpleasant experiences of further breakouts or no changes at all. As with any product, there will be always be imperfections or areas of improvement that need to be addressed with the Aztec Clay being no exception. Despite the massive praise with the product, a small minority of users have been left feeling unsatisfied or unhappy because particular ingredients or the experience itself. Reviewers were wary about using too much apple cider vinegar because it could damage the skin's lipid layer and recommended to use equal amounts of both water and apple cider vinegar. Users also were worried about the redness once it had exceeded the 30 minutes as shown on the instructions and that they felt the tingling, tightening and pulsating sensation after the application was a bit too uncomfortable for their tastes. Another issue that must be mentioned is the usage of metal objects as forbidden for it causes adverse reactions within the minerals in the clay, reducing effectiveness and may cause minor skin problems. Reviewers also did not appreciate the ‘mess' the product made with varying levels of safety and mess added to the fact that the Clay also formed lumps, ‘clogging drains', a consequence of mixing the clay with other liquids. Despite these problems, the Aztec Clay is still relatively an effective product that completes its function as removing skin-care issues and if these minor issues are to be addressed, the product will shine even more prominently within the cosmetic and skincare industry. With so many online retailers to choose from, it can be difficult making a decision as to which online market you should actually purchase from. There are many factors which influence a consumer's decision in purchasing products, which some of the time, may be sacrificed or not prioritised such as customer service, delivery time, security and credibility. However, there is one online retailer that satisfactorily completes all elements of a safe, secure and relatively simple purchasing experience, and that is Amazon. Measure out the required amount of the Bentonite clay, as well as water or any other product you wish to use, then mix it all together until it forms a paste-like consistency. Is this product messy to remove? The mask is relatively messy, depending on how thick the mixture is but is generally easy to remove and may be an inconvenience in cleaning up the mask. Do I use this product with anything else? Apple cider vinegar is recommended when creating the clay mixture, however use equal amounts to balance out the clay, water and apple cider vinegar. Does this product contain lead? No, it contains just 100% Bentonite Clay and other vitamins. Can this be used on other parts of my body? Yes, the clay can be also be used on your neck, hair and any other areas you wish to rid of skincare problems. Does it heal acne scars? The properties within the Aztec Clay should be able to heal acne scars but if it does not, it will at least aim to remove or diminish acne itself. The product is made in Death Valley, California. How often should I use this mask? It depends, 3 times a week is acceptable but any more and redness and pulsating sensations may be more intense. What is the consistency of the clay? Originally in powder form but once mixed with water and other liquids, it will become paste-like, ready for application and will harden once applied to skin. No, despite Bentonite Clay having nutritional benefits, the product is EXTERNAL use not INTERNAL use, seek proper advice if you wish to consume this product. What happens if I eat or drink it? Bentonite Clay does have healthy benefits, so the effects should not be detrimental but be cautious as the product is not FDA approved for consumption. How do I easily get the mask off? Putting warm water on the mask after application may simplify removing the mask. Can you make toothpaste with this? What color is the clay? In powder form it is grey but once mixed, it turns green. Is this sodium or calcium-based? The product is 100% calcium based. Why can't I use metal products? It is advisable that you do not mix the clay using metal products because the Bentonite clay reacts with metal, extracting the toxins which metal objects. We recommend you mix this product with wooden objects to avoid this reaction. Conclusion – Is The Aztec Secret Indian Healing Clay Worth Buying? If you've had the chance to read every section in detail or want to quickly read the final judgement, we hope you understand that the Aztec Secret Indian Healing Clay is a product that is not only affordable but effective in performing its function in diminishing and eliminating acne, blemishes, blackheads as well as whiteheads. The product has many features such as its versatility or its 100% Bentonite Clay properties, just to name a few, and once again, it is completely up to you whether or not you want to purchase the Aztec Clay after looking at its features. Its versatility most certainly needs to be noted where it acts as not only an oral mask, but a facial mask, as well as applicable to areas such as your neck or hair, and even a dietary supplement too! The ingredients are sun-dried to eliminate harmful bacteria and is also customisable with other natural products such as apple cider vinegar, water or Aloe Vera, allowing the Aztec Secret Indian Healing Clay to shine from other products within the cosmetic industry as a versatile yet effective product. 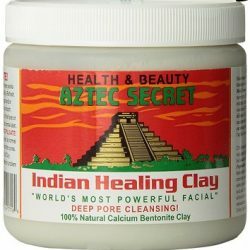 Despite its minor problems of redness, relative messiness, drying and irritation as well as sometimes uncomfortable tightening and pulsating sensations, the Aztec Secret Indian Healing Clay is still a worthwhile investment that is both inexpensive and successful that will ensure your face is removed or at least reduced of skin imperfections where acne, blemishes, pimples and blackheads will be properly treated.